In Russia, a country where traditional gender stereotypes are becoming part of the national identity, feminists pulled out their wild cards for International Women’s Day. Instead of depicting women as ‘tender’ and ‘delicate’ flowers, the group of young people decided it was time for women to be appreciated for what they truly are. In Russia, March 8th isn’t exactly an empowering holiday for women. For a country whose population is mostly female (78 million compared to 66 million men), it’s a moment to celebrate the day of “spring and femininity” as it’s widely called. 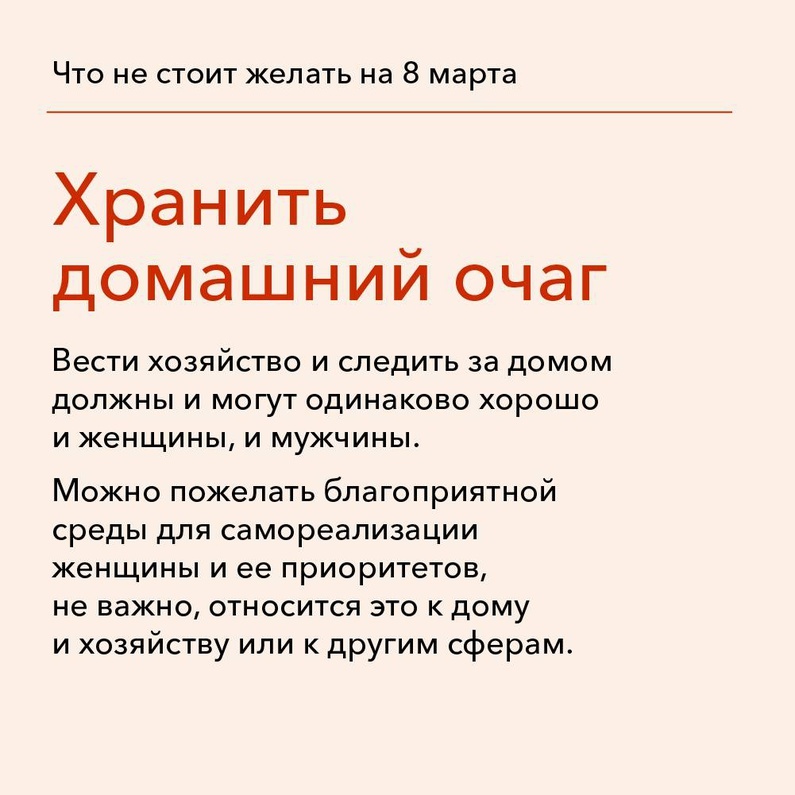 March 8th in Russia is not unlike mother’s day, except that it targets all ‘traditional’ domestic roles that women can embody: the girlfriend, the sister, the daughter, the mother, the grandmother. It’s a moment for the country to hail this “flowery day celebrating the lovely ladies”, for boys in kindergartens to recite verses about beauty and for men in office settings to chip in for cosmetics gift certificates. Not to mention the tidal wave of flowers and gift cards. This year, however, the tables have turned. For a week now, social media users across the country have been passionately discussing a resonant attempt by six young people to challenge the reiteration of traditional gender roles in Russia. The online campaign came just in time for International Women’s Day. On March 1st, sociologist Asya Senicheva from Saint Petersburg shared seven neatly designed cards on social media that “analysed the typical wishes and proposed alternative ones that were a better fit for [celebrating] women’s emancipation.” Within the span of a few hours, these digital gift cards created by Asya and her friends Liubov Chernysheva, Daria Holodova, Ksenia Chapkevich, Anastasia Golovneva, and Jenia Sofronov became the topic of discussion on a Russian social media site as well as Facebook. The post received more than 150,000 views and 4,000 likes on VK (the Russian equivalent of Facebook, ed.) and almost 2,000 shares and 1,000 comments on Facebook. While key figures of Russian feminism endorsed the messages, others criticised the campaign for being too radical and ruining the tradition. 'Being tender' means to not express rigidity and leadership qualities, to be accommodating and flexible. This is an advantage for others and not for women themselves. Instead, you can wish her to be self-confident and persevering. 'Guarding the hearth and home': Housekeeping is both a male and female duty, and both men and women are able to do it equally as well. Instead, you can wish for her to be in an empowering environment, one in which she can attain self-realization, regardless of what she chooses. Asya says the idea for the campaign came when she thought about the shower of wishes that were about to pour down on March 8th. “I thought these cards could be a good way to remind people about the original meaning and goal behind the celebration; to explain why wishing ‘love, femininity and beauty’ on a day where women find solidarity in their struggle for rights and freedom is just not appropriate.” It was a quick and concise way of bringing awareness to gender inequalities and the struggles women face on a day-to-day basis. “Our goal was not to change minds or create [social] guidelines, but to challenge the status quo and make people reflect on the meaning of the International Women’s Day. Cards, unlike long theoretical texts full of gender terminology, are easy to digest and publicly react to. What we wanted was to provoke a discussion.” There is no doubt that the cards provoked a heated debate and comments – both supportive and spiteful – keep appearing on Asya’s Facebook page today. International Women’s Day is an official public holiday in Russia. However, it was not always reputed as a commercialised celebration of femininity. On March 8th 1917 (according to the Gregorian calendar, ed. ), thousands of textile factory workers led by Alexandra Kollontai – a Russian feminist – took to the streets, protesting World War I in what was called “women’s demonstration for bread and peace.” That protest eventually led to the provisional government granting women the right to vote. Later, during World War II, the male population of the Soviet Union fell drastically and in 1959, there were 81.9 men for every 100 women. This meant that a lot of women took charge of the workforce and were often given red roses from the state as a way of thanking them for their hard work. With the fall of the Soviet Union and the rise of capitalism, Russia’s International Women’s Day has become detached from its feminist roots. Still, ‘traditional’ gender roles have always been engrained in Russian society, and the recent insistence from the Russian government to reinforce “traditional family values” over the course of the past years has resulted in a dramatic resurgence of these roles. The position of women in Russian society today is paradoxical: a woman should be lavishly decorated and serve her man while, at the same time, a woman’s ‘weakness’ and ‘fragility’ are depicted as being near-magical ‘powers’ that women use to manipulate men. The result? A woman can be reproached for almost anything (something that often happens on Russian TV). Not being the household breadwinner makes her inferior to her male counterpart, but if she is the breadwinner, then she is seen as hurting her husband and destroying the marriage. Russia’s historic past with International Women’s Day is often used to conceal current problems. Politician Tamara Pletnyova, who is a member of the Duma State Committee on Women, Family and Children, recently intended to discredit a harassment scandal in Duma by saying that: “In Russia, men and women are legally equal since 1917 […] no one will harass a woman if she does not want it.” Women in Russia today are, however, frequently exposed to physical and sexual abuses, victim blaming, intense wage inequalities and live in the only European country that doesn’t have a clear legislation on domestic violence. So when Asya and other feminists are told to “take it easy” and just “enjoy the nice wishes” for International Women’s Day, they are not surprised. For now, Asya’s digital gift cards will continue to “spoil the fun” for this joyous springtime celebration. And all for a good cause: women’s rights.